Georgia, one of the most beautiful and diverse states in the country, is blessed with beautiful state parks, wildlife, mountains, waterfalls, lakes, coastal areas and islands, Civil War and historic sites, gardens, trails, festivals and other fun places to visit. Fortunately, much of this beauty and fun is centered right around Habersham County. In fact, the story of North Georgia is best experienced and understood by visiting and becoming immersed in the natural, cultural, and recreational resources protected within the boundaries of our state parks and historic sites. The southern Appalachian Mountains, waterfalls, wildflowers, wildlife, canyons, history of the Cherokee Indians, the Gold Rush, the Civil War, the Civilian Conservation Corps, hiking, boating, fishing, canoeing, and camping have been and continue to be part of our Georgia heritage. In addition to our own Tallulah Gorge State Park, a number of wonderful parks are located in adjacent counties. Located in Rabun County, Black Rock Mountain State Park, named for its sheer cliffs of dark-colored biotite gneiss, encompasses some of the most outstanding country in Georgia’s Blue Ridge Mountains. Located astride the Eastern Continental Divide at an altitude of 3,640 feet, Black Rock Mountain is the highest state park in Georgia. Numerous scenic overlooks provide spectacular 80-mile vistas of the Southern Appalachians, and several hiking trails lead visitors past wildflowers, cascading streams, small waterfalls and lush forests. The summit visitor center and picnic tables are popular with travelers in northeast Georgia. 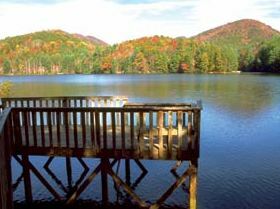 Known as the park “where spring spends the summer,” Moccasin Creek is nestled in the Blue Ridge Mountains on the shores of lovely 2,800-acre Lake Burton in Rabun County. Despite its mountain location, the park is relatively flat, offering easy navigation for large RVs, children’s bicycles and wheelchairs. 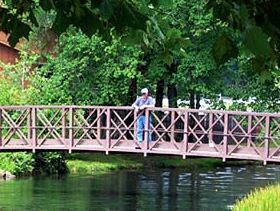 A fully accessible fishing pier sits above a trout-filled creek open only to physically challenged visitors, senior citizens and children. Tour the adjacent trout rearing station, hike on several nearby mountain trails or simply relax in this peaceful setting. The park’s central location makes it a perfect jumping off spot for mountain exploration. In 1966, Traveler’s Rest was recognized as a National Historic Landmark because of its fine architecture, including a 90-foot-long porch and hand-numbered rafters. Today, visitors receive a guided tour of the plantation home. Most furnishings are original antiques, including some made by local craftsman Caleb Shaw. North Georgia's premier trout stream, Dukes Creek, runs through this spectacular mountain property in White County and is a favorite for catch-and-release fishing. Four miles of trails and 18 miles of roads allow hikers and bicyclists to explore hardwoods, streams and wildlife. Trout fishing and van tours are offered only on certain days of the week, so visitors should call for a current schedule. The Lodge at Smithgall Woods is an elegant mountain retreat perfect for romantic getaways or corporate retreats. Five beautifully decorated cottages provide 14 bedrooms with private baths. Rates include accommodations, meals and activities. Smithgall Woods-Dukes Creek Conservation Area was acquired by the state in 1994 as a gift-purchase from Charles A. Smithgall Jr., a noted conservationist and businessman. Nestled in the north Georgia mountains just two miles from the Alpine village of Helen in White County, Unicoi is one of Georgia’s most beloved state parks. Throughout the year, the park offers outstanding programs which focus on natural, cultural, historical and recreational resources. Groups can make advanced reservations for specialized programs. Outdoor enthusiasts will enjoy hiking and biking on scenic mountain trails, especially those leading to Helen and Anna Ruby Falls. Craft lovers should not miss the lodge gift shop specializing in hand-made quilts and local pottery. Numerous picnic tables are located throughout the park. 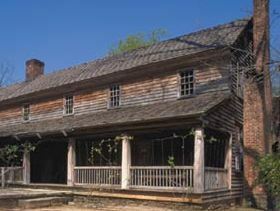 Information for this page from the state of Georgia Parks and Historic Sites website.